The guesthouse is run by propietor Pauline Hastings, who has taken this fantastic accommodation and lovingly restored and updated it. 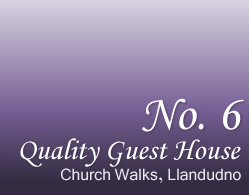 No 6 is located on Church Walks, within 1 minute walk of Llandudno's stunning Victorian Pier and Promenade, we are also within a couple of minutes walk of the North Wales resort's bustling shopping, food and drink areas. We are lucky enough to be in one of Britains most stunning surroundings, with the North Wales coast, Snowdonia National Park and Conwy on our doorstep. 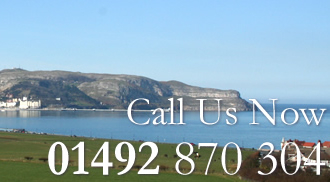 Find out more about our surroundings in North Wales.